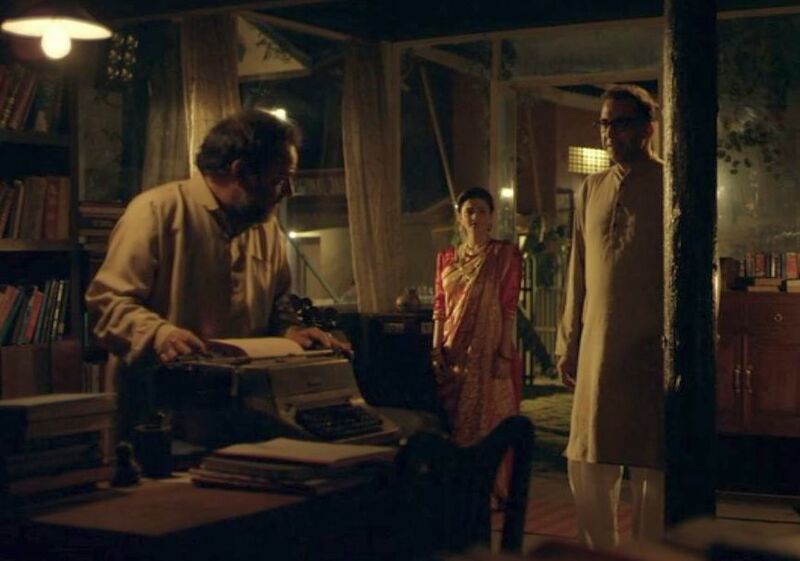 One of Rabindranath Tagore’s more popular short stories, “Kabuliwala” (1892), formed the content of the seventh episode of the recent anthology television series Stories by Rabindranath Tagore (2015) under the general directorship of Anurag Basu. One measure of this story’s popularity is that it has previously been the basis of two successful feature films, the Bengali movie Kabuliwala (1957) and the Hindi movie Kabuliwala (1961). This TV episode, which was directed by Anurag Basu’s wife, Tani Basu, follows Tagore’s story quite closely; however, it features a flashback temporal construction that was not part of the original story . The “Kabuliwala” story is about a poor Afghani Pashtun street trader (known in India as a “Kabuliwala”) in Calcutta who fortuitously strikes up an unusual relationship with a very young girl from an upper-middle class Bengali family. The young girl in Tagore’s story, Mini, is only five years old and described as a relentlessly energetic chatterbox. Actress Amrita Mukherjee, who plays the role of Mini in this episode, is about eight years old and perhaps less exuberant, but she still presents a compellingly cherubic figure. At the outset of the story, a successful Bengali novelist (played by Bobby Parvez) is making extensive preparations for his daughter Mini’s imminent marriage ceremony and celebration. In the midst of these concerns, a somewhat disheveled man off the street, Rahamat (Mushtaq Kak), comes to their home hoping to see Mini. The father does recognize Rahamat, but he has not seen him for the past eight years, because the man has been in prison. The story then shifts into an extended flashback concerning events that took place eight years earlier. Unfortunately this movement into flashback is not well signaled cinematically, and some viewers may be temporarily confused by the changed context. In the flashback, the little girl Mini is seem prattling away to her loving father, who dotingly allows her to interrupt his work on his novel to allow her to proclaim her childish opinions about the world around her. One day, though, Mini notices a Kabuliwala peddling his dried fruit on the urban street in front of her home, and she gleefully calls out to him, “Oh, Kabuliwala!”. When the bearded street peddler, who we see is Rahamat, turns towards her house, Mini runs inside in terror. Seeing this, Mini’s father chides his daughter for being a scaredy-cat, and he politely buys some fruit from the man. Soon, though, Mini’s father observes that the Kabuliwala has overcome Mini’s skittishness and has become her friend. He regularly stops by their house, offering the girl some of his fruit and engaging in children’s games that they mutually concoct. This is the beautiful part of the story – the way Rahamat can lovingly relate to Mini and engage her on her childish terms. We see a series of incidents showing Rahamat on his knees before the child and enthusiastically participating and wrapped up in one of their playfully dreamed-up narratives. One of the pet phrases the Kabuliwala uses is when he naughtily warns Mini about going to the home of her in-laws, a playful reference to something far beyond the little girl’s existing comprehension. She would respond by asking her Kabuliwala whether he would go to his in-laws. These sequences remind us that when we interact with anyone – and with a child, in particular – in order to be effective, we need to relate to a shared narrative that we both embrace and commit to. To a certain extent Mini’s father does this with Mini; but Rahamat does it more fully. He is her best friend. Mini’s mother was alarmed over her daughter’s close friendship with a shabby, perhaps unsavory, older foreign man off the street. She wanted to forbid it, but her husband gave her assurances that the Kabuliwala-Mini relationship was entirely innocent. One day Mini’s father hears a disturbance out on the street in front of his house, and he goes out to see Rahamat being led away in handcuffs. He learns that Rahamat has been arrested for stabbing a customer who had refused to pay his overdue bill. When Mini comes outside and sees her Kabuliwala being led away, she asks him where he is going. He responds by ironically telling her that he is going to the home of his “in-laws”, which is another slang meaning for “going to the in-laws”, i.e. going to jail, that is beyond the girl’s comprehension . That concludes the extended flashback, and we return to the “present”, eight years later. Rahamat wants to once again see his dear little friend. Mini’s father is disturbed to bring his about-to-be-married daughter before the ex-convict Rahamat on this portentous day, but when he once again perceives the sincerity of the man, he relents. When Rahamat finally sees Mini, he is struck by the realization that his dear friend has grown up into a young woman and has all but forgotten him. He realizes that his own only daughter, of the same age as Mini, back in Afghanistan has similarly grown up and now may barely remember her own father. He breaks down in tears. At this point it is revealed that Rahamat’s love for Mini was a surrogate expression of his parental love for his own daughter back in Afghanistan. When Mini’s father sees this, he realizes that he shares a deep bond and sympathy with the man. The universal feeling of parental love for one’s innocent child transcends all the class, cultural, and national differences that might be presumed to separate the two men. Even a man capable of a violent, homicidal act can share this with an educated compassionate humanist. Both men are going through the shared and inevitable pain of seeing their daughters fly off to their new in-laws. As a partial expression for his sympathy, Mini’s father immediately gives Rahamat a considerable sum of money that will enable the Kabuliwala to return home and see his own daughter. And so at the end of this story, we are left to ponder how that reunion may turn out. This poignant expression of the universality of parental love is the charming theme of this story. Rabindranath Tagore, “Kabuliwala”, (1892). (trans. by Mohammad A. Quayum, Flinders Open Access Research, Volume 1, Issue 2, May 2009, Flinders University, Adelaide, Australia). Durga S, “Kabuliwala – Stories by Rabindranath Tagore (3)”, Writersbrew, (3 August 2015).